The Leatherman Wingman is just that: your go-to tool for projects around the house, on the job, or at the campsite. A great, lightweight, pocket-sized, stainless steel tool; the Wingman features Leatherman's patented one-hand opening and newly-designed spring-action jaws. With plenty of handy tools, and backed by a team of designers, assemblers, and manufacturing crew from Portland, Oregon, this is one amazing value. Covered by the Leatherman 25-year warranty. Love this Wingman. 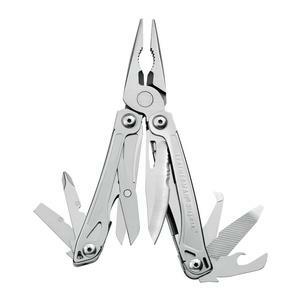 Am generally moving to Leatherman as I find the Gerbers I have had are brilliantly designed but use weak or brittle metal or have been poorly put together. Wingman is just right for me in many situations; Id say on domestic tasks and when gardening (on lawnmower chain saw and similar). The Wingman complements my Leatherman Surge which is good for heavy and more brutal jobs. (For me just one multitool just doesnt do it all.) Cant believe how many times a day I use the Wingman its just so easy to access the clip is great the blade is SHARP the scissors are good and the spring loaded pliers are BRILLIANT. That is such a really standout advantage of the Wingman and I wish the Surge had spring loaded pliers too.